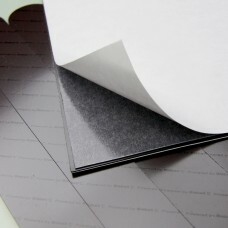 Adhesive Backed Magnetic Sheets. Plain magnetic sheet with a release paper covered acrylic adhesive on the non magnetic side – the magnetic side has a UV coating to help protect the material and aid handling. Adhesive Backed Magnetic Material 1000mm wide x 0.5mm thick x select the metres you require abo..
Adhesive Backed Magnetic 0.5mm thick 5 A4 sheets Plain material with a release paper covered acr..